What Happens When You Breed a Pitbull With an American Bulldog? The American pit bull terrier and the American bulldog are both sturdy, medium-sized dogs with a history of being good work dogs and loyal pets. 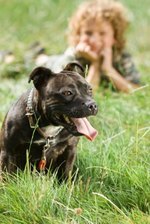 It's understandable that you might want to breed one with the other for the purposes of creating a specific type of working dog, but before you do, it's important to understand that pit bulls were originally created by breeding terriers and bulldogs. So they are, in essence, already half bulldog. This means breeding a pit bull with an American bulldog will really only result in something that is like a pit bull, but with a little more bulldog. Both APBTs and American bulldogs are powerfully built, short-coated, medium-sized dogs. They have broad heads, but their muzzles differ. The pit bull's muzzle is deeper than the bulldog's, but because a pit bull is already essentially half bulldog, offspring are likely to have a shorter, wider muzzle similar to the bulldog's. Both breeds come in a variety of colors, so their offspring may exhibit virtually any color pattern. Again, pit bulls and bulldogs behave very similarly. They are highly energetic and need plenty of exercise and attention to keep from getting bored and lonely. A lonely pit bull can be destructive, and with his natural strength he can tear holes in drywall, rip dog doors off their hinges and more. Both breeds are extremely friendly, loyal dogs, but also have strong, assertive personalities. Dogs are pack animals, and a mix of these two dogs is going to do best with an owner who can establish himself as a dominant, but caring, pack leader who cannot be challenged. Unless they are conditioned to distrust humans, pit bulls are so friendly that experts recommend not using them as guard dogs because they are unlikely to attack a stranger. Bulldogs are sometimes distrustful of strangers, so APBT/bulldog puppies may be more reserved with strangers than a pit bull. These are easily groomed dogs, requiring only a quick brush every now and then to help limit shedding and a trimming of the nails from time to time. Bulldogs can also drool quite a bit, so if your mixed puppy has a jaw structure more like the bulldog, he will probably also be a drooler. Both breeds are susceptible to the genetic bone deformity that causes hip dysplasia, so this is definitely something to have your mixed puppy tested for. Bulldogs may also develop elbow dysplasia, can experience ACL tears and bone cancer and are vulnerable to a number of eye problems. In addition to hip dysplasia, pit bulls can experience cerebellar degeneration, cancer and progressive retinal atrophy.